She might have ditched the shades in her new video, but the baseball cap, gold chains – and street attitude – are still very much part of the musical phenomenon known as Honey G.
The Jewish rapper, whose real name is Anna Georgette Gilford, exploded onto ITV’s talent show, X Factor, last year. Proving herself more divisive than Marmite, Honey G attracted her fair share of fans and critics alike and even became one of the most searched female celebrities on Google in 2016 – just behind Meghan Markle, Prince Harry’s actress girlfriend and troubled reality star Stephanie Davis. Honey G made it into the last five finalists and was swiftly signed up by Simon Cowell’s Syco label. While her deal with Syco proved short-lived, the 36-year-old musician is now back with her new single, Hit You With The Honey G, released on her very own label, H To The O Music and has ambitiously set her sights on making herself a name to be reckoned with in the international charts. Speaking to Jewish News this week, Honey G revealed that X Factor had “completely changed my life” and described her whirlwind months since leaving the show. Honey G even fitted in a trip to Los Angeles for an exclusive performance for her mentor, Sharon Osbourne and her daughter, Kelly, at the Hollywood Roosevelt Hotel. She’s especially close with the latter, but the singer is equally fond of Sharon, whom she credits with helping launch her new career. While the pair never discussed their shared Jewish backgrounds, Honey G did reveal her Jewishness was “something I’m incredibly proud of” and kvelled when her mother, Yvonne, would drop by the X Factor house with freshly-made chicken soup. Growing up in Harrow (or “north Weezy” as she infamously described it on the show), the young Honey G first made a name for herself as a gifted tennis player, winning bronze at the 1995 European Maccabi Games in Amsterdam, as well as representing Great Britain as a flag holder at the North American Maccabi Games the following year. But music has also been a lifelong passion for Honey G.
She developed her production skills with an undergraduate degree in popular music and recording at Salford University, and took an interest in rapping around five years ago. Her solid music credentials jar in the face of critics who called her a novelty act, or as one national newspaper put it, “the biggest joke in X Factor history”. But those kind of barbs don’t faze someone like Honey G.
“In terms of the haters, it’s very hurtful when people say I’m a parody or novelty act, I have genuinely come from a musical background,” she replies with her trademark street talk. Suffice to say, the “haters” included the likes of Piers Morgan, who labelled her “grotesque” and “diabolical”. I ask what she thinks of him now, almost a year after she appeared on X Factor. “Piers hasn’t been very kind to me in the past and I had to block him on Twitter – he wrote me a rude message. I don’t really care much for him to be honest. He’s criticised me in the past, but what is he? Aside from critics, the rapper has also had to contend with her debut single, The Honey G Show, not even making the top 100 after its release and being dropped by Simon Cowell’s label after just a few months. 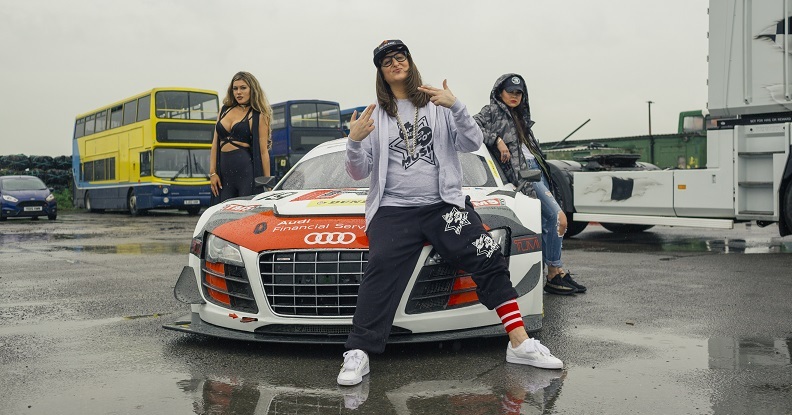 Honey G has gone all out for her new single, Hit You With The Honey G, which has been mixed and mastered by Grammy-winning engineer Liam Nolan, as well as an eye-popping video featuring buses, fast cars and a woman on a horse. 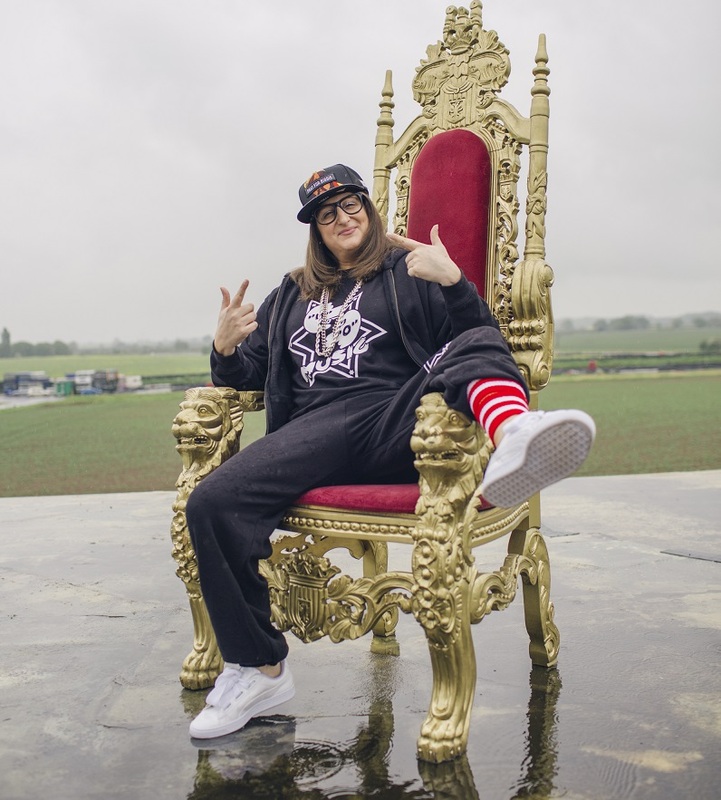 There’s even a golden throne for Honey G to sit upon, with the rapper ditching sunglasses for regular glasses – a nod, she says, to 1980s hip hop group, Run DMC. Her schedule for the months ahead is swiftly filling up, with a university tour and panto already confirmed, plus of course, working on an album. “I’d love to go global”, she declares. Love or hate her, there’s something infectious about this hard-working rapper who continues to defy her critics and prove her act might somehow be genius – with a capital G.
Hit You With The Honey G is out now and available on iTunes.